How To Lead Nature’s Way and Instantly Banish Your Dog’s Problem Behavior Forever! It’s Time! You Know It. Let’s Do It! Claim Your FREE Ticket Now! Your dog loves you…and you love your dog, but you’re miserable dealing with the problem behavior. Dogs are not happy when they’re barking all the time. Or they act aggressively with other dogs or people. Or they’re so anxious that they chew and scratch and destroy whenever you’re gone. Or they’re unruly or hyped up all the time. And they don’t live as long when they are anxious or ramped up or in conflict all the time. But that’s not the way it has to be! What your dog needs is a leader. When dogs have the RIGHT kind of leadership then they can relax and calm down. There is no need for anxiousness or aggressiveness or hyped up behavior. The RIGHT kind of leadership makes all that problem behavior unnecessary! But do you know how to do that? You see it on the TV shows, but unfortunately what we get is based on outdated info about dominance. But you know what? That stuff is outdated. And it’s NOT how Mother Nature does it! If there is even a glimmer of doubt in your mind about your ability to provide your dog the kind of guidance and leadership that shows her that she can relax and just be a Well Behaved dog, then you need to attend How To Lead Nature’s Way and Banish Your Dog’s Problem Behavior Forever! Walking your dog feels like being pulled behind a motorboat! Wish he would just stop barking at EVERYTHING! You love your dog but you don’t love his behavior! Join me on November24th at the Tuckahoe Branch of The Henrico Public Library (Big Meeting Room) and learn How To Lead Nature’s Way and Banish Your Dog’s Problem Behavior Forever! Register early and get in the drawing to win a FREE training session for you and your dog! Look, if you love your dog but not her behavior then you owe it to yourself and your dog to reserve your spot at How to Lead Nature’s Way and Banish Your Dog’s Problem Behavior Forever! Your Dog NEEDS You To Step Up! 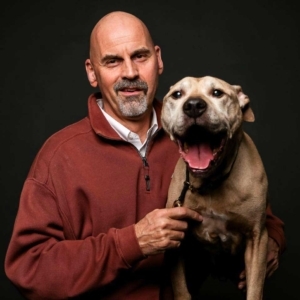 For the past 20 years, Doug Poynter has helped dogs and their owners overcome K9 Behavior problems. For the past 30 years, he has coached, taught or trained people in one fashion or another, starting out of college as a tennis teaching professional in Richmond, Virginia. He then moved to the corporate world as a Sales Trainer and Coach. During that time he exercised his love for dogs and training by developing and training the New Adopter’s class for the F.U.R.S. (Friends United with the Richmond Shelter) rescue organization. During the 5 years that he taught the class the return rate for F.U.R.S. adopted dogs went from over 20% to under 1%. He has a unique connection to dogs and he is also able to relate to their human families and teach them how to live and work as a team. “Behavior problems are what I specialize in. Separation anxiety, unruly behavior, out of control barking, fear, aggression, general not listening or paying attention, OCD and neurotic behavior are all areas I work in. What I find is that although these are K9 Behavior problems, human owners are a big part of the equation. Maybe the biggest part.